This shot was taken on November 3, 2013 at 1:22 PM. The location was in the back yard of my house in Bethesda, MD. The "Take It!" was in an instant. I had just walked down those stairs and not paid any attention to this intense blast of sunlight that had been influenced by the edge of the deck matched up with the position of the sun in the afternoon fall sky. The lessening of leaves on the trees also had their influence on how this light became so bright. A part of the fascination with this photo, is the depth of the shadows and colors showing up as the white light dissipates. The After Take: All who saw this photo thought it was cool. I really is rather self explanatory - so did not elicit much comment - only appreciation for the catch at that instant. Yes, another lucky catch - and to add to it - the chance to share it via this means. Sometimes a leisurely backyard tour on the spur of the moment, can bring big returns. You could do geometry with lines like that. This photo to me seems almost somber. I'm not sure why but that was the feeling that sparked when I first looked at it. 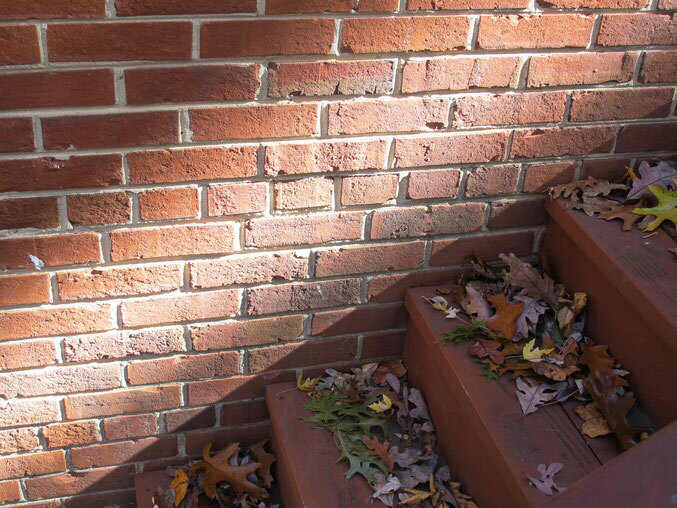 Great shot, I love how the leaves add some contrast to the maroon of the bricks and steps.